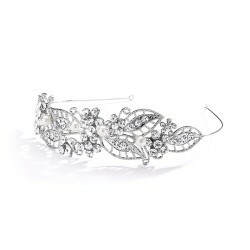 This elegant Bridal Tiara or Wedding Headband has the Victorian understatement of delicate leaves ad.. This intricate Mariell heapiece makes a bold bridal statement in its simplicity. Skilled artisans ha.. Skilled artisans meticulously hand-wire a row of Genuine Preciosa crystals to a distinctive wavy ban..
Mariell's breathtaking headband features a side design of shimmering wildflowers. The Genuine Crysta..
Rhinestone Tiara Comb with Crystal Beads..
Give your customers the royal treatment with one of Mariell's beautiful tiaras. This crystal crown i..
Mariell's tiara combs are the perfect accessory to finish of any prom or pageant hairstyle. 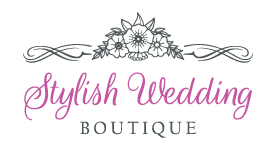 The vint..
Mariell's best selling 3-piece wedding ensemble includes a stunning handmade necklace, shimmering da..